Another Reason to Stop Climate Change: Allergies! 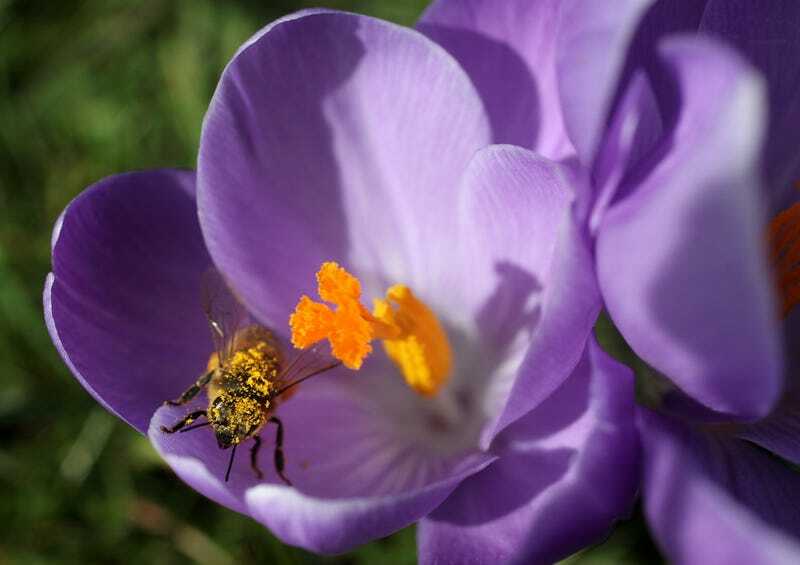 A bee collects pollen from the stamens of a flowering crocus in the Royal Botanic Gardens in London, England. Climate change is causing all sorts of problems across the planet, but here’s one you probably haven’t heard of: it’s making the allergy season longer and more intense. A report from Climate Central outlined how warmer temperatures across the U.S. have led to steadily longer growing seasons, which gives flowering plants more more opportunities to release pollen into the air. The report found that states in the Western U.S. have experienced the most change, with an additional 17 frost-free days; the North East comes close behind with an average of 10 more growing days. And it’s not just that plants have more time to spread their pollen around; the increased carbon dioxide in the atmosphere allows some photosynthesizers to increase the volume of pollen they produce. A lab study from 2016 showed that certain grasses emit “roughly twice as much pollen” when exposed to twice as much CO2, and that ragweed grew faster and put out more pollen as CO2 increased. Similarly, a study from 2003 in Baltimore found that pollen producing weeds grew faster and flowered earlier inside the city (which tends to have higher CO2 levels) than in the countryside. So, more pollen for longer periods of time. But we’re not done yet. In addition to increased allergies, our incessant burning of fossil fuels is dirtying up the air all across the planet. And less rain and more heat means that the pollution stays in the air longer, creating a myriad of health problems. According to the World Health Organization (WHO), about 7 million people die annually because of the effects of air pollution. And unless we curb our emissions ASAP, this pollution problem is only projected to get worse, with some pretty drastic consequences. One projection published in Nature Climate Change found that unabated pollution will lead to 60,000 extra deaths globally each year by 2030, and 260,000 extra deaths annually by 2100. Another study from the American Geophysical Union estimates that by 2090, asthma-related ER visits for kids could increase by as much as 10% across most of the U.S.